The court heard Clarke was "deeply disturbed"
A senior school teacher who murdered a pensioner and left a teenager permanently disabled has been jailed for life. Thomas Clarke, of Victoria Road, Dukinfield, Greater Manchester, developed the urge to kill from watching scenes of murder and torture on his computer, a court heard. 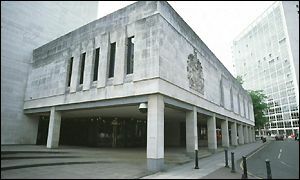 The 30-year-old, who was suffering from a personality disorder, admitted murder and attempted murder at Manchester Crown Court. Both attacks happened in April when Clarke was off work with stress from his job as head of science at Egerton Park School, Denton. His first victim was a teenage student, Michael Kay, who he stabbed in the arm and chest in the street. He later murdered 71-year-old Dennis Cotterill, who he had spotted at random while on an evening stroll, in Ashton-under-Lyne. The retired dustman had been stabbed in the heart and died in hospital. Clarke rang the police two days after the killing and asked them to arrest him, telling a detective: "I won't be any trouble... I just need to stop doing this." Alan Conrad QC, prosecuting, said detectives found evidence on Clarke's computer relating to various sites dealing with torture and murder. Peter Wright QC, defending, said his client was suffering from a personality disorder, but had now expressed the desire to receive treatment. Manchester Recorder, Judge Sir Rhys Davies, told Clarke he was "an intelligent but deeply disturbed and dangerous man". He jailed him for life for murder and sentenced him to 15 years to run concurrently for the attempted murder.